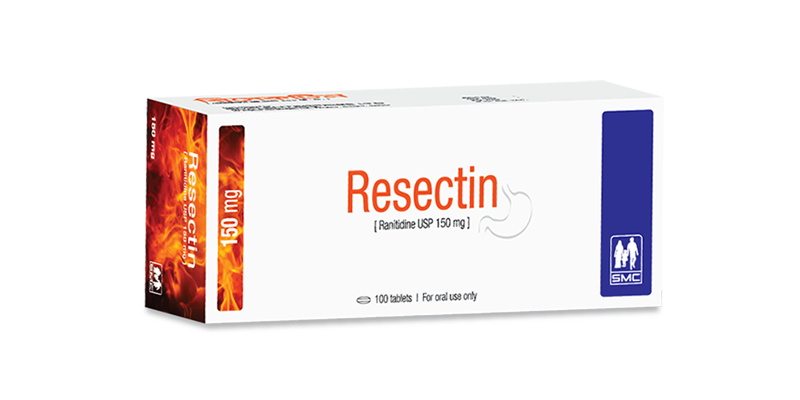 Resectin tablet: Each film coated tablet contains Ranitidine Hydrochloride USP 168 mg equivalent to Ranitidine 150 mg.
Resectin tablet contains a medicine called Ranitidine. This belongs to a group of medicines called H2-receptor antagonists. It lowers the amount of acid in stomach. Benign gastric and duodenal ulcer: 150 mg twice daily for 4 weeks Gastro-esophageal reflux disease: 150 mg twice daily for up to 8 weeks Zollinger-Ellison syndrome: 150 mg 3 times daily. The recommended oral dose for the treatment of peptic ulcer in children is 2 mg/kg to 4 mg/kg twice daily to a maximum of 300 mg.
Pregnancy and lactation: Ranitidine should be used considering the risk benefit ratio. Headache, flatulence, nausea, abdominal pain, diarrhea, dry mouth, dizziness/vertigo and constipation. Caution should be taken in patients with renal impairment, pregnancy & lactation. Resectin tablet: Each box contains 10 x 10’s tablet in blister pack.